…there were 47 applications for 2 to 3 selected winners. If you’re keeping score at home, that’s about the same ratio as the Hunger Games or the acceptance rate for getting into Stanford. The city’s announcement indicates that they will be announcing their decisions in May. 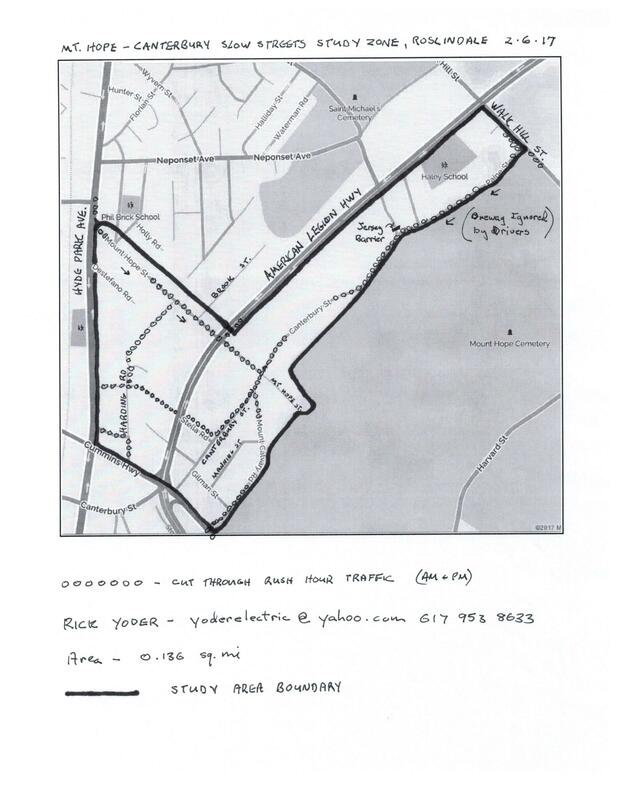 We understand that all 4 of the Roslindale applications we were tracking were submitted. We’ll update as we have more information. Well done, neighbors!!! It’s a wrap – 4th and final standout is in the books! Thanks all!!! A cloudy but not too cold day. We had six stalwarts (see photo below, one of our number had to leave a couple minutes earlier) and note that the Dynamic Duo of Guptill and Tedrow kept their perfect record intact. Being out at this location, which was the subject of a Vision Zero Rapid Response installation after Silvia Acosta’s death last year, reminded us that we need to follow up, repair the broken/missing flexposts, and move toward making the installation permanent. And so on we go! It’s been almost 2 years, but the 874-878 South Street proposal that was the subject of a WUR long-form blog post in July 2015 is finally returning with a revised proposal. 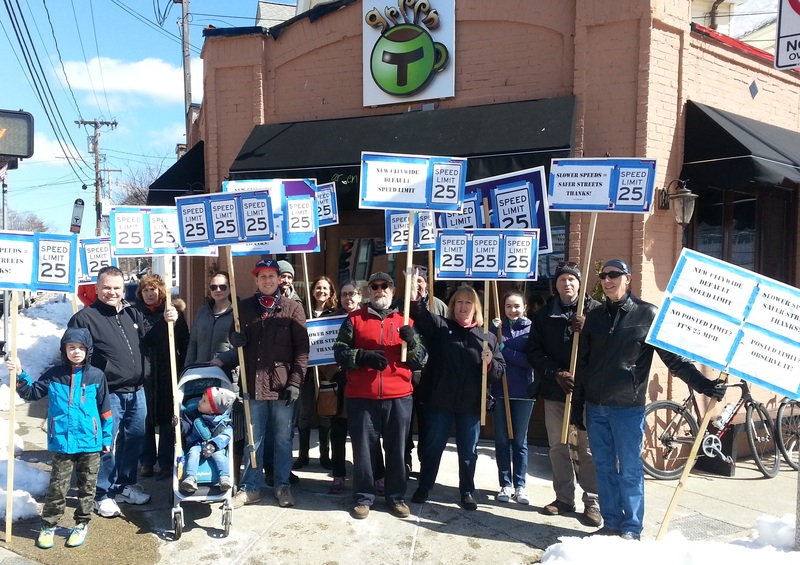 The meeting has been scheduled for Tuesday, March 28, at 6:30 pm at the Roslindale Community Center. Flyer for meeting here. Based on what was said by the property owner and his attorney at the LANA meeting a week or so ago, it sounds like the proposal will be for 9 residential units with 18 off-street parking spaces. For those keeping score at home, that’s a reduction from the original proposal of 6 residential units and an increase of 3 off-street parking spaces. Revised plans were not available at the LANA meeting, though they will reportedly be available this coming Tuesday. For the record, I continue to live 2 blocks from this location. From my own perspective and given this location within walking distance of the commuter rail station and Roslindale Square, the revised unit count is lower than it should be and the number of off-street parking spaces is at least 4 spaces too many. I would really prefer a 1-to-1 space to unit ratio at this location. 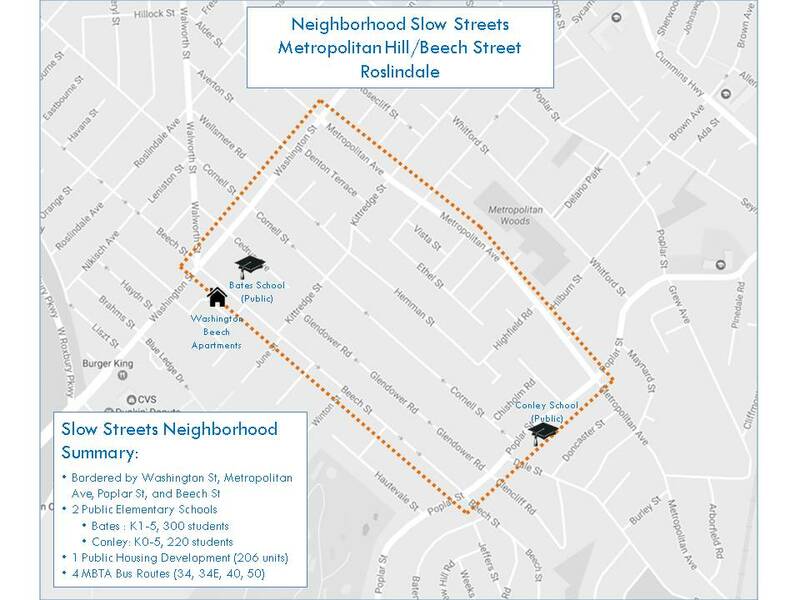 While I recognize some neighbors see this issue differently, on-street parking issues at this location and along the stretch of South Street and the intersecting streets toward the commuter rail are relatively minimal, except on Sunday mornings. Increasing the parking space count here may prevent there ever being an issue from this development related to on-street parking, but it will tend to increase vehicle traffic by encouraging car ownership by development residents and, to the extent automatically included with each unit, will increase the cost of each unit in the development. 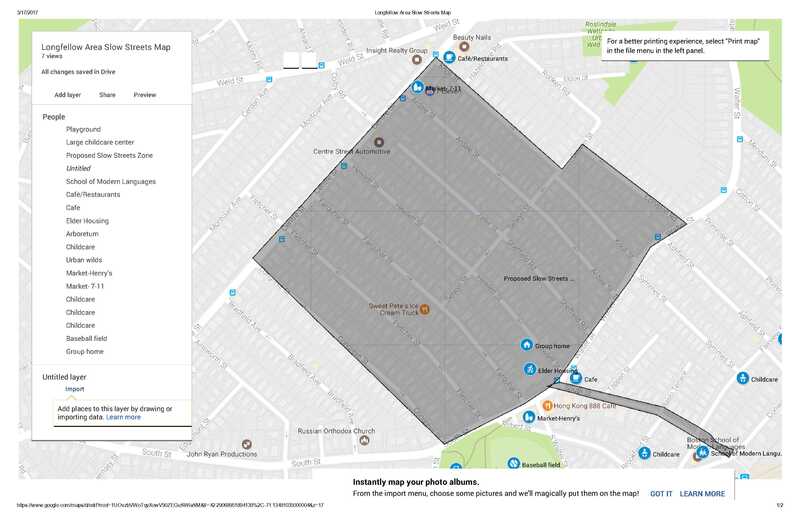 Accordingly, in addition to wanting to see the revised design, I will be interested in a discussion of the parking space count, how the revised plans locate those spaces on the site, what kind of space is left over, and how much consideration is or isn’t being given to bicycle parking and encouraging bicycling and walking as well as zipcar and transit use. No peppy name this time. This will be the fourth and final installment of our standout series. The location this time is at the main southern entrance to our neighborhood and the place where our neighbor, Silvia Acosta, was killed by a hit and run driver while crossing Washington Street in a crosswalk. It would be great to top last week’s 14 participants, so feel free to bring a sign along with yourself and your great attitude. Thanks in advance!!! Standout #3 – Big numbers on a beautiful day for Beyond Thunderdome! I count a total of 13 in the photo who held signs (there are a couple of fellow travelers mixed in) and one of our number took it, so that’s 14 – one more person than we had signs. Messrs. Guptill and Tedrow are in the running for perfect 25 mph standout attendance!!! Longfellow Area (from Knoll to Congreve, between Centre and South/Walter plus the spur of South from the Walter-South intersection to the commuter rail station): LINK to survey. Contact: Rob Orthman, robert.orthman@nullgmail.com. Lower South Street (South/Bussey intersection down through the Archdale bridge, covering the side streets between South and Washington to Firth and then crossing Washington to pick up the side streets between Florence and Washington down to Cummins). SURVEY LINK. Contact: Steve Gag, stevengag@nullgmail.com. 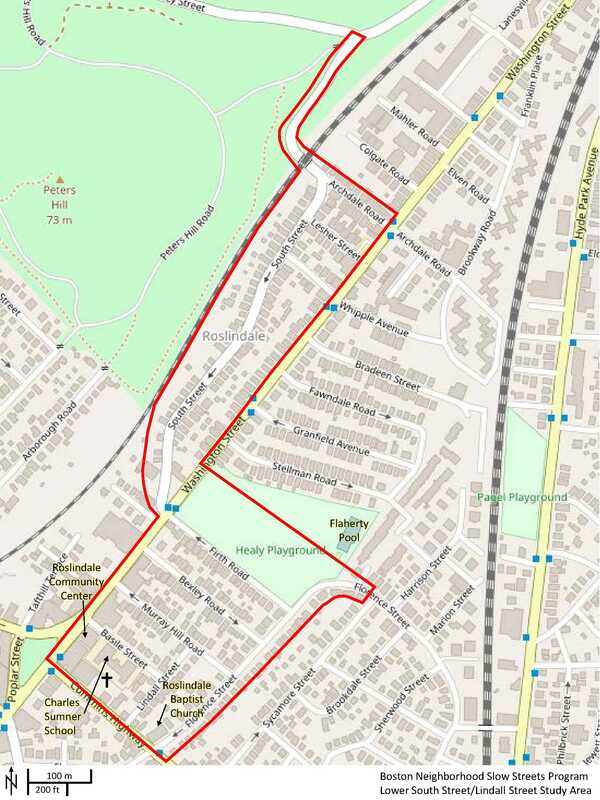 Metropolitan Hill/Beech Street (Metropolitan to Beech, Washington to Poplar): LINK here. Contact: Sarah Kurpiel Lee, stk1221@nullgmail.com. Mount Hope/Canterbury (residential side streets off of American Legion, from Walk Hill and Mount Hope to Cummins). Contact: Lisa Beatman, lisabeatman@nullyahoo.com. And your faithful correspondent will stand a round of coffee/hot chocolate at Green T to all participants promptly upon conclusion of the standout at Noon!!! BE THERE, BEYOND THUNDERDOME!!!!! WalkUP Roslindale’s Standout #2 is ON. Location is noted above. 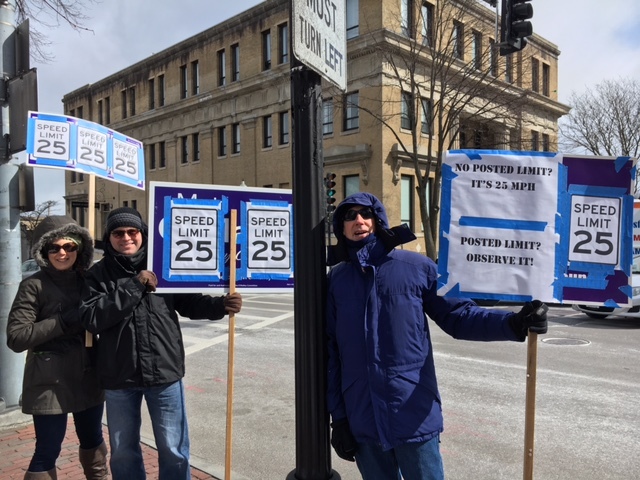 We’ll convene near the fire station on the Cummins side and fan out around the intersection for an hour of promoting the new citywide default speed limit. Though the forecast looks chilly, we will forge ahead. We would love to see you there, so bundle up and come on down!!! 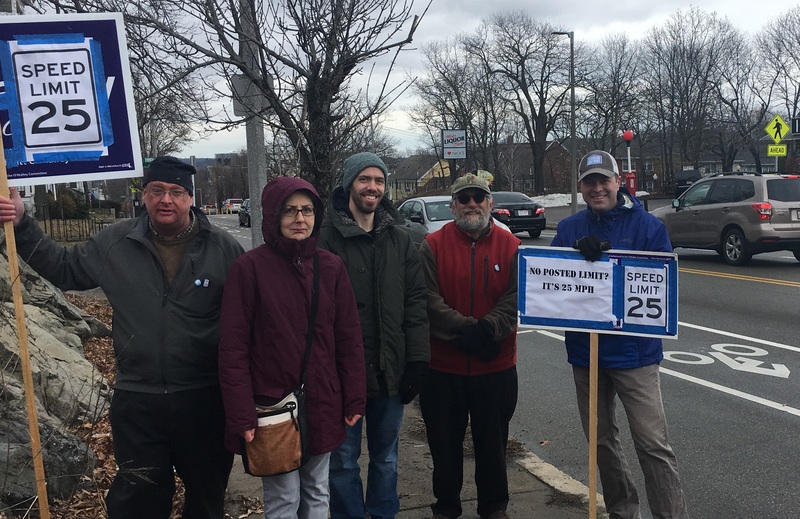 PS Last week’s standout received positive coverage in this week’s Roslindale Bulletin: WalkUP reminds everyone 25 is the limit! REPORT FROM THE FIELD OF THE SECOND STANDOUT: Very cold again!! Standout participants numbered six — Mses. Beatman, Phillips, and (Lynn), and Messrs. Guptill, Tedrow, and Lawlor. On to #3 – Walter/South!! Standout #1 in the books — Cold but spirited! Pictured: Liz, Matt, and Steve (L to R).